For more information please visit at "pressurejet" website. High pressure washer is a high pressure reciprocating piston pump that uses high pressure water jet to remove mold, grime, dust, mud and dirt from surfaces and objects such as buildings, vehicles, concrete road surfaces etc�. A high pressure washer is also known as electric power washer. Pressure Jet supplies a complete line of diesel, gas, gasoline and electric pressure power washers for private owners, power washing contractors and industrial users. Chose from hand carry, base mount, wall mount, portable, skid, pick-up mount, trailer mounted, and gas cart power washer designs. 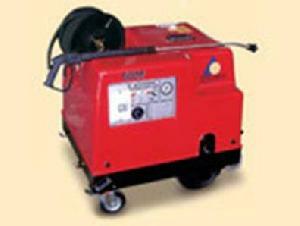 Best electric high pressure power washer pumps & systems are designed with the wide range of pressure and flow rate. These excellent water pressure washer machines can be used for light, medium and heavy-duty jobs. They are quite and easy to use. If you want a portable and light duty unit with more pressure considers a mobile gas pressure washer. They are designed for cleaning large areas in remote surroundings, where no electricity is available. As commercial high pressure washers & surface cleaner, they offer a convenience of independency and easy maneuverability. Diesel pressure power washer units are designed for the same high pressure cleaning applications as our mobile gasoline pressure washers, but they are equipped with extended life diesel engines. Our heavy-duty industrial high pressure power washer cleaners typically use metal wands and stainless steel nozzle tips, and are equipped with the durable, long life pumps for continuous duty operation. They are the best built power washers in power washing industry and are very popular among pressure cleaning contractors. hydraulic pressure power washer & trailer mounted pressure power washers can be supplied on request.